﻿ APOEL Nicosia 0-6 Real Madrid. Six goals to fight the depression! 21.11.2017 » APOEL Nicosia 0-6 Real Madrid. Six goals to fight the depression! 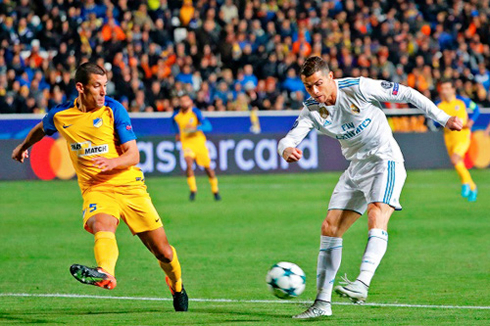 Real Madrid responded their critics with half a dozen goals in their Champions League clash against APOEL, with both Benzema and Cristiano Ronaldo leading the scoring charts with two goals each. The Merengues are through to the last-16 stage in second place in Group H, only behind Tottenham. I think we asked for goals right? 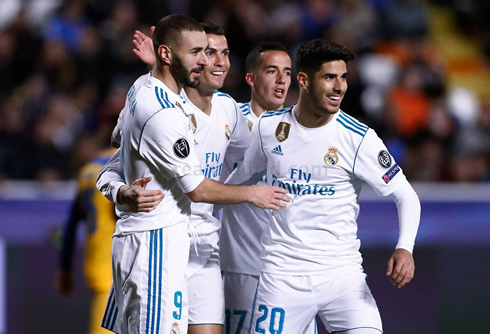 Well, we certainly were satisfied tonight, as Real Madrid romped past APOEL Nicosia today to the tune of 6-0, securing their qualification to the knockout phases of the UEFA Champions League and inadvertently eliminating Borussia Dortmund in the process. Zinedine Zidane's men will finish in second behind Tottenham Hotspur, who also won their game tonight as they beat Dortmund by 2-1 at the Signal Iduna Park. It was a welcome result for a Madrid side that has come under fire in recent weeks for their lackluster performances and ineptitude in front of goal. 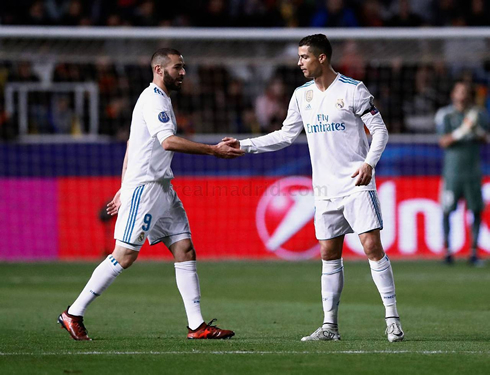 Cristiano Ronaldo, in particular, was back to his high scoring ways netting a double and notching an assist as well, setting up Karim Benzema in the first half. Speaking of the Frenchman, it was likely his best game of the season so far, as he scored a double himself in the first half. Luka Modric opened the scoring before that, with a well-hit volley that just bounced in front of the keeper making it difficult for him. And Nacho's goal (after a flick on from Varane) was sandwiched between the two Benzema strikes. It was already 4-0 at halftime and Madrid looked like the team we've grown to love, not the frustrating outfit we've seen this season. This game alone may not exactly silence the critics who will point to the weakness of the opponent as the reason for the victory, but there was something different about the team today and it could cause a conundrum for Zidane going forward. And this is where Isco comes into play. With the magician on the bench, Madrid looked far more dangerous moving the ball forward. I've mentioned in recent weeks that Isco's influence on the game was beginning to become a detriment to the team despite his fantastic play on the pitch. And today may have been more proof of that. With a more structured lineup, both Kroos and Modric were able to leave their imprint on the game. Even Lucas Vasquez, who is nothing more than a workhorse at times, helped as he stayed in position and gave the team a sense of structure. Isco often slows down the play with his dribbling, effectively ruining Madrid's counter-attacking options. We saw them in full flight for Benzema's second as Kroos, Benzema, and Ronaldo took all of seven seconds to go from one end to the other. Ronaldo too was lively today and it seemed as if he was liberated after scoring that header in the second half. His second goal showed ultimate effort as he sprinted to the ball and hit a 1-time shot with his weaker foot into an open net. All in all, it was exactly the kind of result Real Madrid needed to get their confidence back. It will be very interesting to see how Zidane lines up on the weekend, as he may be tempted to go with what worked today. Cristiano Ronaldo next game for Real Madrid is on November 25 of 2017 against Malaga. You can watch Juventus live stream, Real Madrid vs Malaga, Juventus vs Barcelona, Basel vs Manchester United, Qarabag vs Chelsea, and PSG vs Celtic, all matches provided from our live soccer game pages.